Earlier this month, Mozilla announced that Firefox OS smartphones would no longer be sold via carriers. 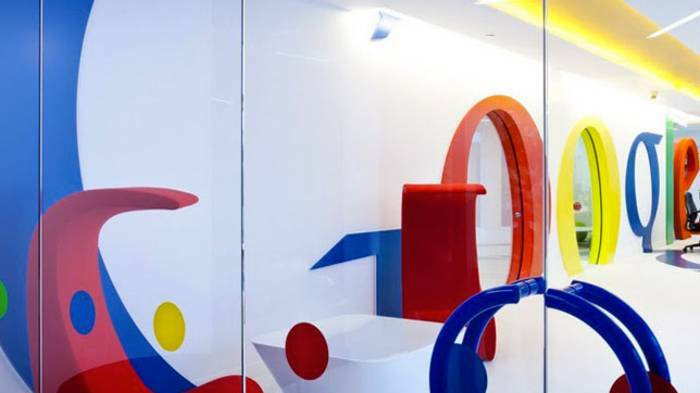 Because the company refused to talk about what’s next for Firefox OS, aside from saying it will experiment with “connected devices,” many were left simply to speculate as to what could be in the pipeline. Today, we have a leaked document, which Mozilla confirmed is legitimate. 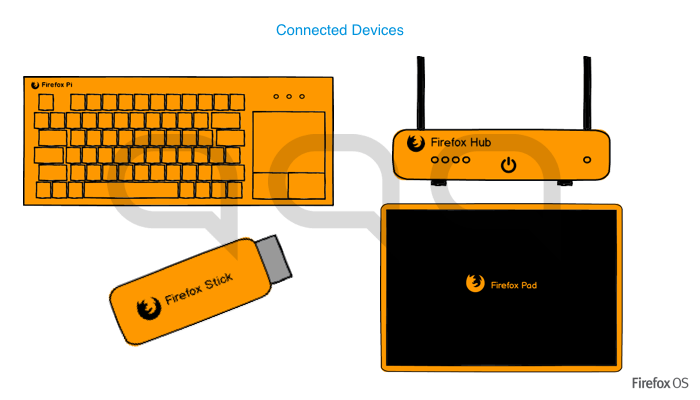 Leaked by Spanish blog Hipertextual, the document shows four Firefox OS devices: a tablet, a router, a smart TV stick, and a keyboard computer. Two of these have been done in some capacity before, but all four are labeled as “connected devices.” We naturally asked Mozilla for more information. “At Mozilla we work in the open and we are still at the early stages of exploring and prototyping new use cases for Firefox OS in the world of connected devices as an open source project with a clear focus on the user benefit and experience,” Denelle Dixon-Thayer, Mozilla’s chief legal and business officer, said in a statement. Great, but what about the above products; is this even a real leak? “This document represents early product concept work by one of our developers,” Dixon-Thayer confirmed. 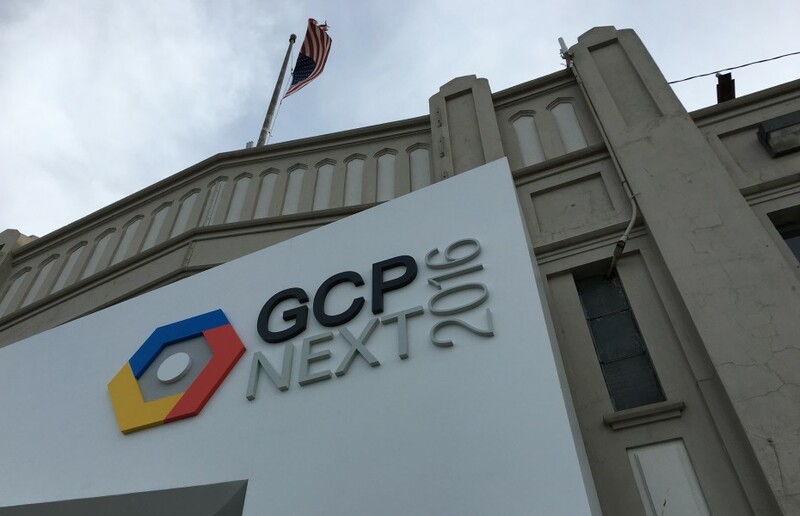 Like any tech company, Mozilla loves to experiment with new ideas. That said, the company isn’t confirming that these projects are currently in development, so don’t hold your breath. They may never see the light of day. First up, we have the Firefox Pad. 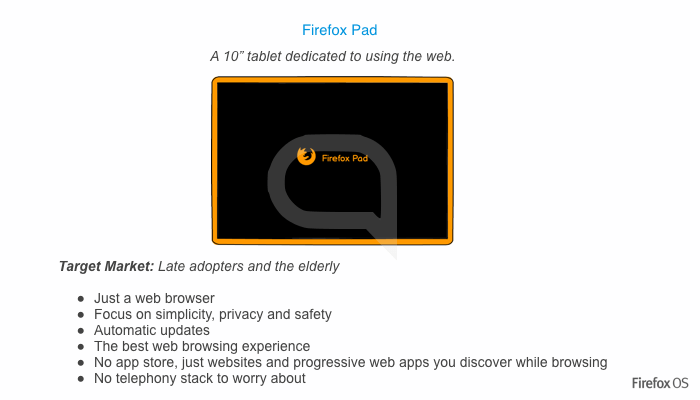 Keep in mind that Firefox OS tablets already exist. If a 10-inch Firefox-branded tablet never materializes, it’s frankly not a huge loss. Firefox Pad is an intriguing idea, as it’s essentially a Chrome OS device without the keyboard, but it would be more of a step backwards than anything (tablets are gaining keyboards and laptops are gaining touchscreens, not the other way around). Firefox OS smart TVs are also available. 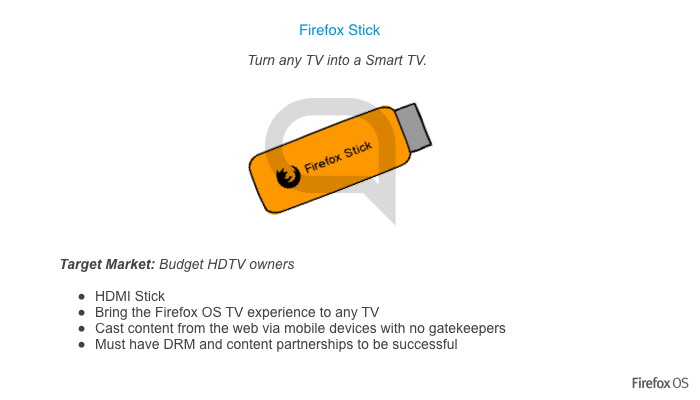 In addition, Matchstick already tried and failed to sell a Firefox OS-powered TV stick. Mozilla could try again with the Firefox brand, but it’s a hard sell, given the tight-margin competition between tech giants Google and Amazon. The other two product concepts are more interesting. The router makes a lot of sense, while the keyboard computer is a bit of a stretch, but still very intriguing. 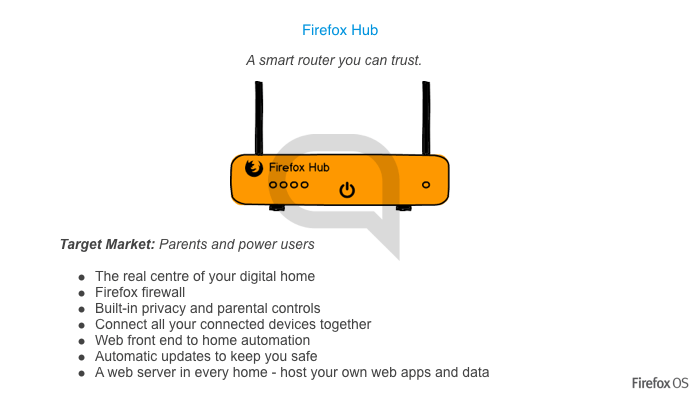 The Firefox Hub router (not to be confused with Firefox Hub add-ons) would apparently, and unsurprisingly, be focused on security. 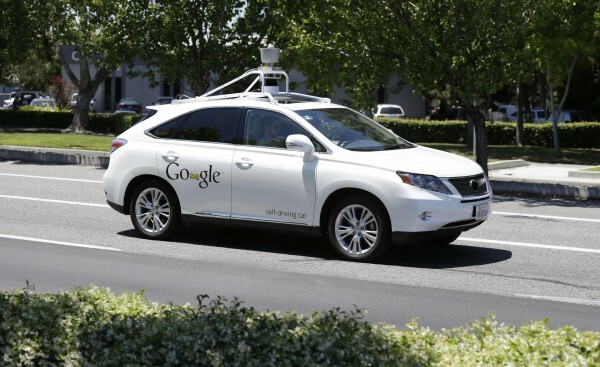 It could potentially mesh well with Mozilla’s privacy strategy. 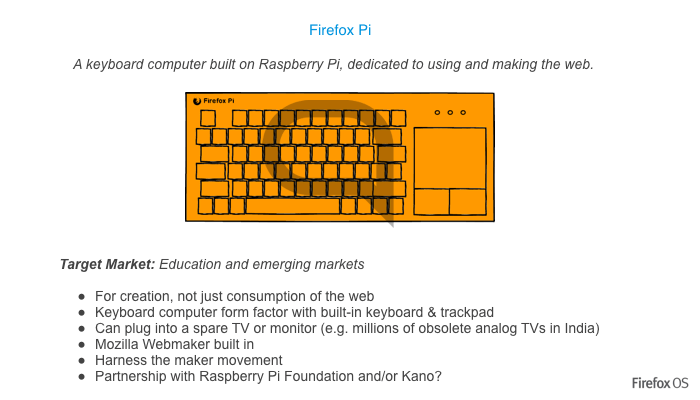 The Firefox Pi would, meanwhile, push Mozilla’s Webmaker initiative, aimed at promoting the building blocks of the Web. The “Pi” in the name implies a potential partnership with Raspberry Pi. Again, these are just concepts. Mozilla emphasized repeatedly that it isn’t yet ready to discuss the future of Firefox OS. As it stands right now, we may continue to see Firefox OS tablets and smart TVs (even smartphones not sold via carriers are still possible), but nothing else. That said, given that Mozilla is making a point of not sharing any additional details right now, we expect more changes to be revealed in the near future (maybe even as soon as CES).